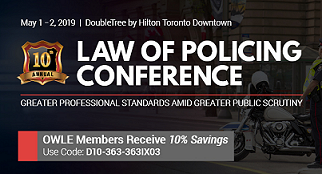 Ontario Women in Law Enforcement is an organization that grew from an idea to bring together the female members of the law enforcement field from across the province. Recognizing the importance of communication and co-operation, we extend our membership to both women and men. Check back regularly to stay up to date on the latest OWLE events, news and job postings. The Ontario Association Chiefs of Police (OACP) is pleased to advise that Serving With Pride (SWP), Toronto Police Service – LGBTQ Internal Support Network (TPS-LGBTQ ISN) and Ottawa Police Service in partnership with DFF Productions will be announcing a new documentary project called ‘comingoutcops’. Celebrating inclusion and diversity and in addition, supporting local athletes to achieve their dreams.